Other photos: Top Deck, Upper Helm, Aft Seating, Top Deck Looking Forward, Side Deck, Fore Deck, Aft Deck, Bathing Platform, Salon, Dining Area, Galley, Steps to Lower Cabin, VIP Cabin, Bathroom, Twin Port Cabin, Twin Stbd Cabin, Master Cabin, Bathroom, Layout Plan. 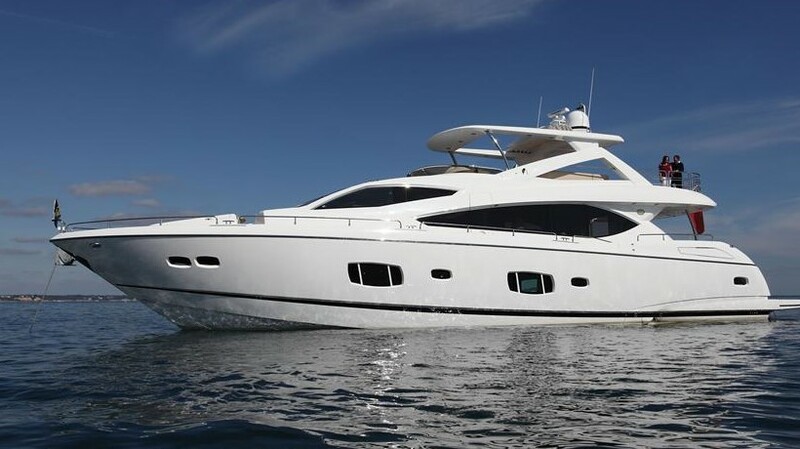 A stunning example of a Sunseeker 90 built in 2008, seriously for sale as her owner is upgrading. She has an expansive upper deck with plenty of seating, wet bar with bar stools, a teak dining table and all weather sun pad aft. She is fitted with twin anchors, bow and stern thruster, hydraulic bathing platform and Trac fin stabiliser. The Salon is open plan with the dining area forward and separate galley to port and the bridge can be completely closed aft for night time cruising. There is a forward VIP cabin, two twin cabins which convert to doubles and a full beam owners cabin. The vessel has been priced to sell at USD 2,200,000. Please call to arrange an inspection. NB: This vessel has been personally inspected by our broker, Miles Clark. We are the owner's direct agent appointed to sell the vessel. We have a full inventory and extensive photographs of the vessel which we will be pleased to forward to you upon request. Please email us for further information. SYS Yacht Sales is pleased to assist you in the purchase of this vessel. This boat is centrally listed by Seanergy Ltd..